It will make a stopover after a naval exercise on the Andalusian coast and citizens can visit it on Saturday and Sunday. 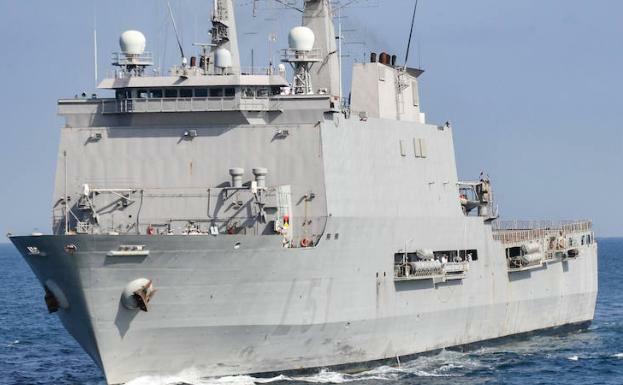 The amphibious assault ship ‘Galicia’ will stop tomorrow at the Port of Malaga and will remain moored in the Adosado to the Dique de Levante (ADL), in the extension of Pier Uno, until Sunday, where it will hold a day of open doors to the public, according to sources from the Navy. Its construction began in May 1996 at the factory of the national company Bazán (today Navantia) in Ferrol. It was launched in July 1997 and delivered to the Navy on April 29, 1998, to replace the old attack transport L-21 ‘Castilla’. It is the seventh ship in the history of the Spanish Navy that bears the name of the autonomous community of Galicia. Among the missions in which the ‘Galicia’ has participated, it is worth highlighting the ‘Free Hidalgo’ operation in support of the United Nations mission for the maintenance of peace in Lebanon (2006); and the ‘Atalanta’ operation against piracy in Somali waters on four occasions: 2010, 2011, 2015 and 2017. Designed for the transport and disembarkation of troops and vehicles by means of boats and helicopters, the main mission of the ships class ‘Galicia’ is to carry out amphibious operations. Its missions also include peacekeeping and humanitarian aid actions in natural catastrophes, as they are adequate to provide medical and surgical support and transport of material. The ‘Galicia’ is participating in the ‘GRUFLEX-19’ exercise, maneuvers that began on March 31 and will end precisely tomorrow. This takes place in the waters of the Bay of Huelva; as well as in the Médano del Loro firing range (Gulf of Cádiz), in the Naval Base of Rota and the training field of the Sierra del Retín (Cádiz). This type of exercises serves the units of the Navy to train periodically in amphibious operations, to maintain the projection capacity of a force on land from the sea, as well as humanitarian aid and response to crisis situations. The ship ‘Galicia’ plans to arrive at the Port of Malaga tomorrow. The units of the Amphibious and Projection Group of the Navy participate:LHD (Landing Helicopter Dock) ‘Juan Carlos I’; BAA (Amphibious Assault Ship) ‘Galicia’ and eight amphibious landing boats of the Naval Beach Group, as well as the BAC (Combat Supplying Ship) ‘Cantabria’. In addition, it has involved mobilizing the Marine Infantry Brigade as a landing force, II Landing Battalion and support units; the aerial means of the Aircraft Fleet (Harrier Aircraft, Sea King helicopters, H500, AB-212 and Scan Eagle); collaborators of the Electronic War Battalion 31 and of the RACTA-4 of the ET (in the Retin) and a P-3M aircraft of Maritime Patrol of the Air Force.